Canadian participants in the Lausanne Congress, held in Cape Town late last month. Photo by Marion Franklin. This is part two of CC.com’s overview of the Lausanne Congress, held in Cape Town October 16-25. Part one is available here. ‘Reconciliation between Peoples’ provided a dramatic pairing of speakers from two often opposed factions. Leadership was another issue addressed by several participants. “God loves you as a person even more than he loves what you do as a leader . . . There is a subtle erosion that begins to take place in many of us leaders, and we begin to question God’s intentions for us. We come to misunderstand what God intends [for] us, and begin to compensate by ‘doing’ more. Artist Hyatt Moore seen at Lausanne with one of his trademark international portraits. Photo by Flyn Ritchie. The persecution of Christians was a topic which resonated with many in attendance, as noted by the October 19 InterVarsity blog written by York Moore. Western Christians, he noted, “often read and hear about the persecuted church; but here at Lausanne 2010, the persecuted church has faces and names. While most nearly all Chinese delegates to Lausanne were denied departure from China and some detained, a handful of Chinese Christians are here in Cape Town for the Congress. One of this country’s pre-eminent Christian leaders considered Cape Town 2010 a very valuable experience for the Canadians in attendance. “Canada had 50 participants and almost on equal number of support staff present during the Congress,” Bruce Clemenger told CC.com. The president of the Evangelical Fellowship of Canada found the experience “a stimulating and uplifting gathering,” and noted several highlights. “The theme verse was ‘God in Christ, reconciling the world to himself,’ from 2 Corinthians 5:19. Amidst the music, drama and excellent speakers, everyone was assigned to a table… where each morning we studied the letter of Ephesians and prayed together. Murray Moerman, formerly with Outreach Canada and now ministering in England, took some powerful lessons from his own Lausanne experience. On exhibit at Lausanne III: The Word & the Spirit, by Leigh Telli. Lausanne III, he said, “was unforgettable. It was hugely inspirational. It was deeply motivational. It was history-making for the global church of Jesus Christ. And it was a landmark happening that set a benchmark of mega organizational excellence, which I can’t visualize being matched again anywhere for a long time to come. Fresh motivation for the furthering of world evangelization was also the theme of the Cape Town Commitment, a major statement from the Lausanne organizers. 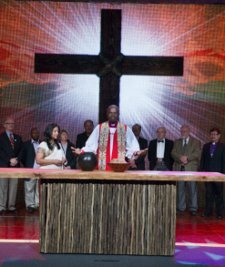 Archbishop Henry Luke Orombi of Uganda, center, prepares for communion during closing ceremonies at Cape Town 2010. “Our love for the whole gospel, as God’s glorious good news in Christ, for every dimension of his creation — for it has all been ravaged by sin and evil. “Our love for the whole church, as God’s people, redeemed by Christ from every nation on earth and every age of history, to share God’s mission in this age and glorify him forever in the age to come. “Our love for the whole world, so far from God but so close to his heart, the world that God so loved that he gave his only Son for its salvation. As it was during the event, the concern for persecuted Christians remained uppermost afterwards in the thoughts of some participants. Photos courtesy of The Lausanne Movement, except where otherwise noted.